Finding fault. – Dirty wet dog , boats and sailing. In the last post i briefly talked about doing a boat viewing at very long distance from home, today i would like to be back aboard that same boat having a brew and just taking the time to think about it….mainly trying to find all the faults in a boat of that age and that type. On the day, Pete the owner, kindly left us alone for an hour or so while we had a good poke around down below opening up all the lockers and looking into every angle and corner that we could. When we had seen as much as we feasibly could, and without then requesting a haul-out and underwater inspection which might have been feasible had we another day spare we all went back to the clubhouse and looked through Pete’s extensive files on the boat. Not only the original adverts for the boat…..you don’t even want to know the original cost from new ! but even the certificates of registry and the original ‘blue book’ of a British registered vessel. Pete says that the boat has had quite a bit of serious work done over the years, for example quite a few frames ‘sistered’ , a new transom, new mast and extended boom and gaff. His opinion is that what she needs now is a thorough spruce-up of the paint and varnish. I think she would benefit from having the broken frames repaired by scarphing-in new sections or preferably doing a step-laminate of new thin sections gradually getting longer. I’ve never done that but i do just see it as a matter of time and patience rather than mega-skill. On the day of the visit something i said to Jackie was that if i liked the boat then my job was to find every defect and fault and every good reason to not go head over heels and buy her outright on the day. I have to be brutally honest and admit that i have little practical experience with fixing wooden boats. I did once have a Folkboat with many cracked frames, had a boatbuilder repair them and then the surveyor go ballistic because the boatbuilder hadn’t done what the surveyor specified. 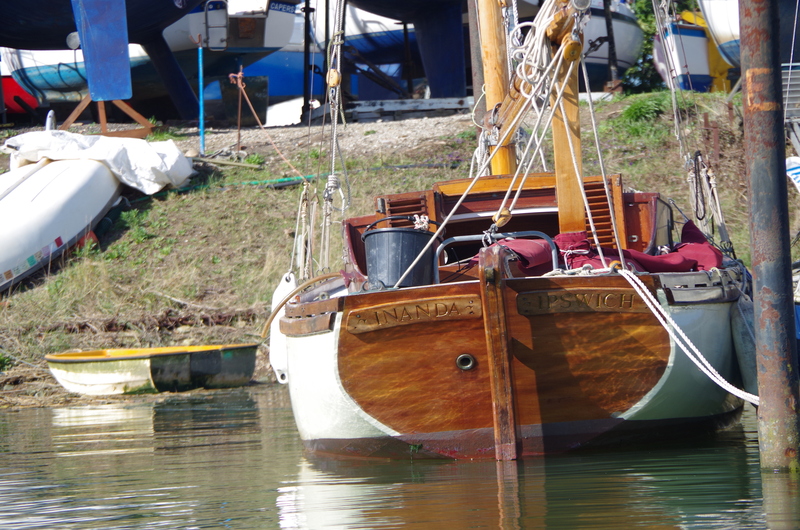 My other boat was a ply and epoxy Wharram cat, which although it had other problems didn’t have the problems of a 70 year old classically constructed boat. Crucially i did briefly own another Deben and aside from 2 or 3 good sailing days strongly came to dislike that particular boat. I’m not a superstitious sailor but that boat clearly disliked me….not only chucking me out of my bunk but then trying to have me overboard. Not only that but she clearly had some rot, very open seams, cracked frames, the wrong rig and etc and so on. I could potentially have rescued her maybe by drying her out totally, ripping the caulking right out, splining her and epoxy-veneer sheathing the hull. After that she would merely have needed a complete new rig, sails and fit-out. There are times when i have to admit that i have taken on more that i can deal with….and with working a stressful job at the time that was clearly one of those times. Now, i am 10 years further down the line, had the one boat i always wanted (Frances 26) , had another one that i always like the look of (Liberty) and find myself at age 60 where i can set out a logical set of requirements for a boat but also know that i want something less definable in a boat …..i want soul and practicability. Inanda clearly has a long history of many owners, some better, some worse. Pete i know bought her for his grown-up children to race and cruise but now wants to pass her on to an owner that will care for her and maybe pass her on to another owner in years to come in a better state than she is now. It’s not quite like buying a highly sought-after classic like a Fife say or more realistically something like a Harry Butler but i do feel that there is a higher than average requirement to be a conscientious and diligent owner and only take her on if i feel i can step up to the mark and be a ‘good’ owner. It won’t be adequate with this boat to be like the owner of the GRP tub next to Inanda which is so green it has its own ecosystem and a cockpit which is both full of rainwater and somehow ‘alive’. Today then is the first day that i sit down and do an honest appraisal of 2 things : first what is genuinely an actual fault list with that boat and secondly to find a similar fault list with its potential new owner….that’l be me then. We know that i could soon have a flexibility and mobility issue and maybe have a limited ability to work on my knees. The greater question is whether i would be up to doing particularly the woodwork required….the best description of me as a ‘boatbuilder’ being ‘fast and dirty’ : except not particularly fast !